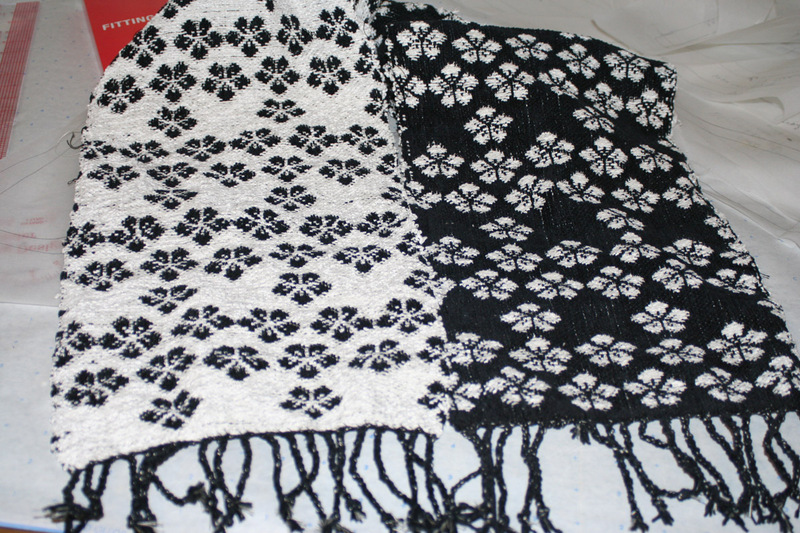 Next post: Handwoven article, and finished scarf! 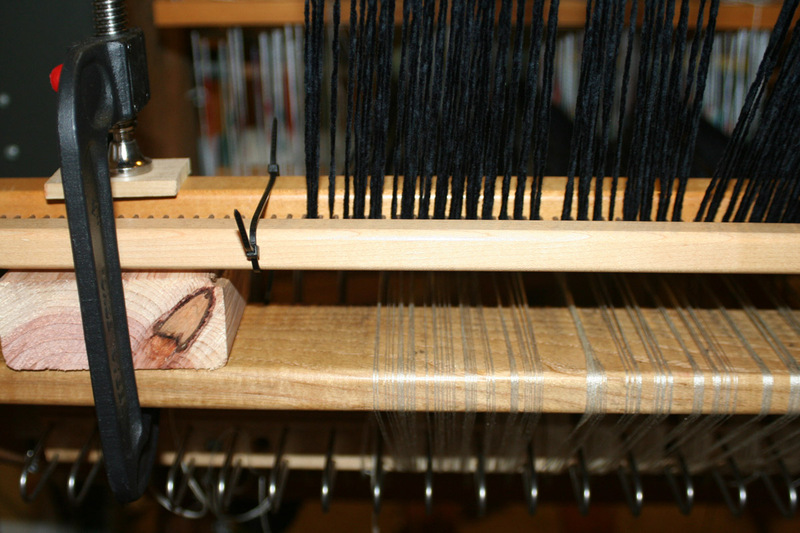 The warp passes through the raddle clamped to the back beam of the loom (better photos on that a little further down), up and over the top of the trapeze, and is weighted by a pair of barbell weights.Â The barbell weights are tied to a piece of string and attached to the warp with a lark’s-head knot wrapped around the bout of warp.Â Here I am using 2 bouts for a 12″ warp, each with its own weight. 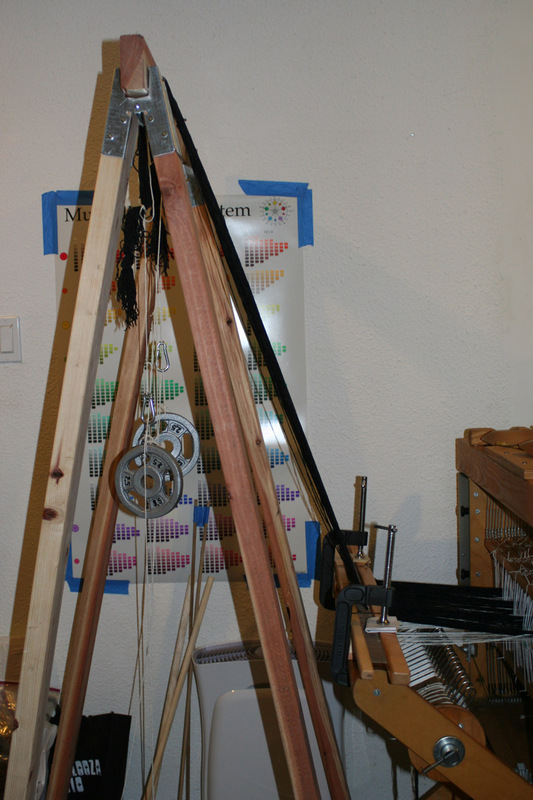 The photo here is blurry (sorry – had trouble getting the camera to focus correctly), but you can see the important bits.Â The raddle is clamped to the back beam, using a block of wood as a spacer to make sure it isn’t sitting directly on the warp beneath it (which is beamed on in the usual way).Â This means that the top warp comes in at a bit of an angle, but it doesn’t seem to have done any harm. Here the spacers are a bit clearer.Â I used sections of 2×4 lumber, but I needed the extra space to clear the rounded protrusions at the ends of my back beam (see 1st photo of raddle).Â I’d use as small a spacer as I could get away with and not have one warp interfering with the other; I suspect it would produce better results. I used two sawhorse brackets ($7.58 a pair at my local hardware store), and screwed four legs into the brackets.Â Then, as directed by the instructions, I stuck a piece of 2×4 as a crosspiece, and screwed it down as well.Â This results in a very stable trapeze.Â I had no problems with it tipping over, but if you find you do, try drilling a hole through each of the back legs about 1.5-2 feet off the floor.Â Attach a long bolt through the hole, secure it with a nut so it doesn’t slip around, and then hang a barbell weight (or some other weight) on the part of the bolt protruding from the hole.Â That ought to stabilize things. And now, just in case you were wondering what I’ve been up to (besides taking photos of my trapeze! ), voila! A freshly finished scarf in diversified plain weave, hemstitched, fringed, and ready for dyeing. I soaked it in soda ash and scrunch-dyed it this morning, in purples, blues, and an occasional drip of bright fuchsia.Â Tomorrow morning I’ll unfold it, rinse it out, and see how I like it! Creative solution, Tien. 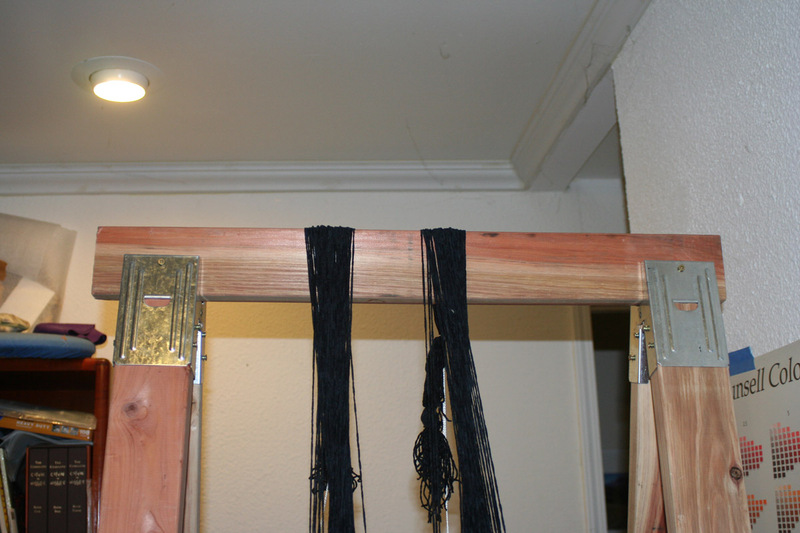 Just make sure your Trapeze top bar stays parallel to your loom’s back beam. 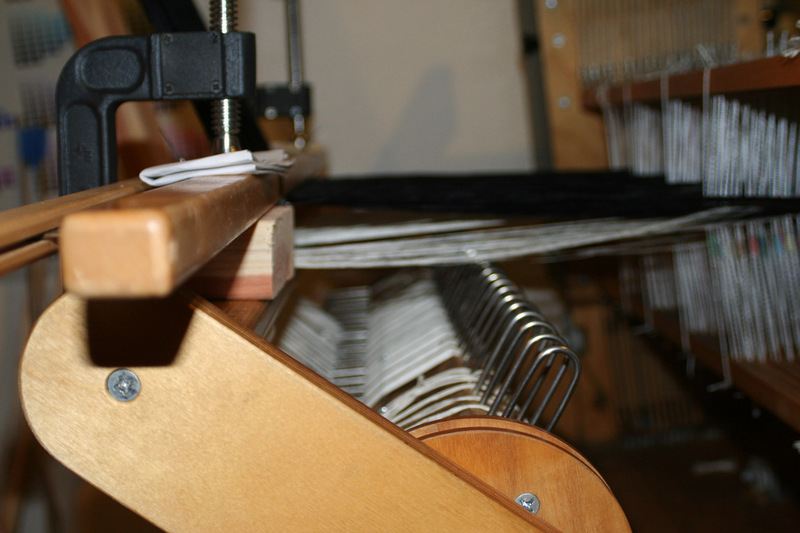 This is the same caution as when beaming a warp with a Trapeze that is not secured to the loom’s frame.